These unique greetings cards are perfect for any occasion – birthday, festival, thank-you, display, etc. 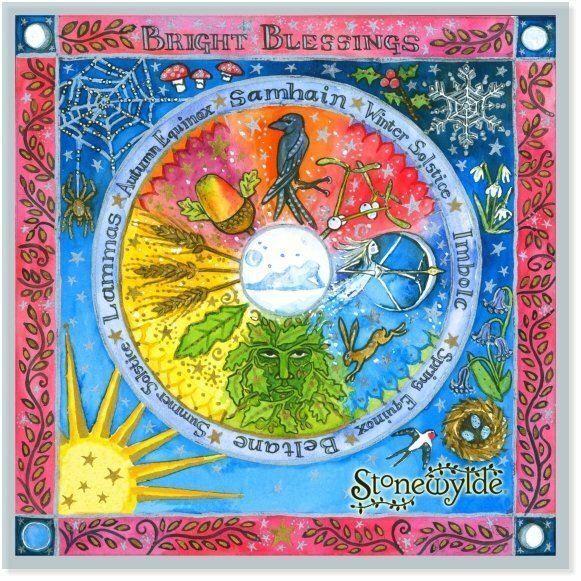 They were commissioned to represent the Wheel of the Year as described in the Stonwylde books, illustrating the eight festivals and their appropriate symbols, with the full moon in the centre. The original is a beautiful painting created by Kit Berry’s sister at HelixTree, who also helped design the Stonewylde logo. 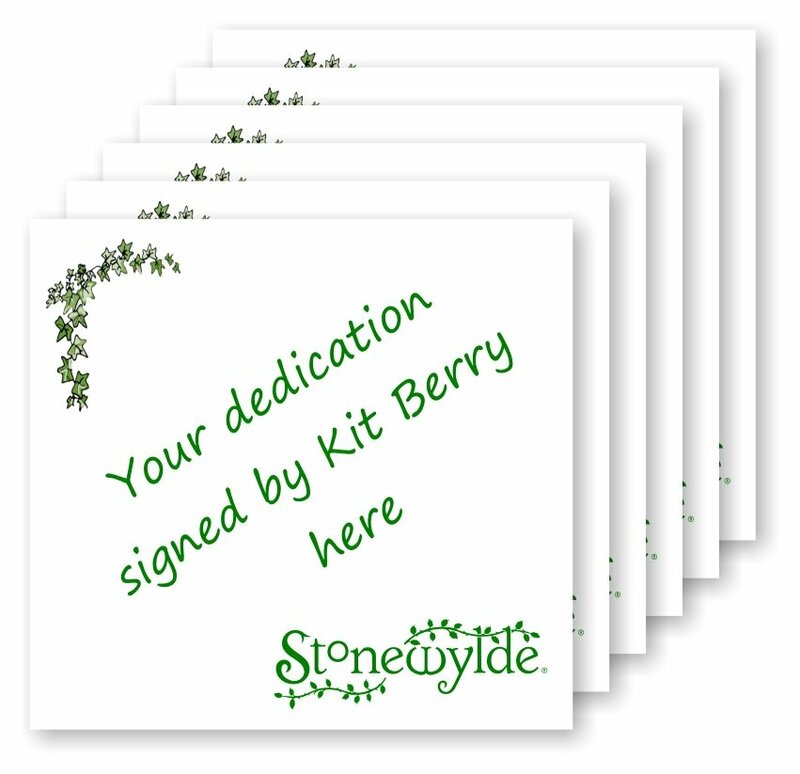 The Stonewylde greetings cards are available in quantities of 5 representing excellent value. There’s also FREE postage and packing on these items. Each card has its own white envelope. The front of the card shows the Wheel of the Year in exquisite detail. 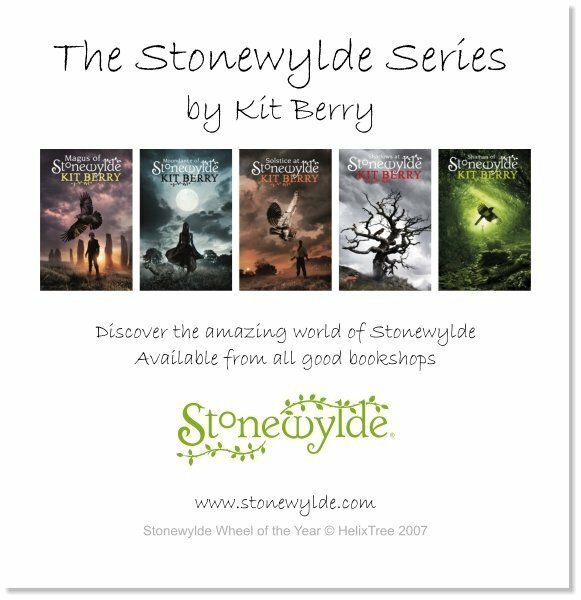 The back page shows thumbnails of all five books in the series together with the Stonewylde logo. Please support Stonewylde and send these highly original greetings cards to your friends and family. They also make a lovely gift and are so versatile, with plenty of room inside so they can be used at notelets as well as greetings cards. I was pleased with the cards I received. to choose from as well. These wheel of the year cards have a delightful design printed on high quality card. Blank inside, they can be used as general cards or for any of the festivals (Samhain, Imbolc, Beltane, Lammas, solstices or equinox) shown on the front.